I say fragmentation, only because that's what everybody wants you to believe about our beloved devices. That many devices are running different versions. That is true... but as services go, it's pretty good. Anyways, this isn't a blog about that viewpoint, but just to report on the numbers. You know me, I'm the numbers guy. 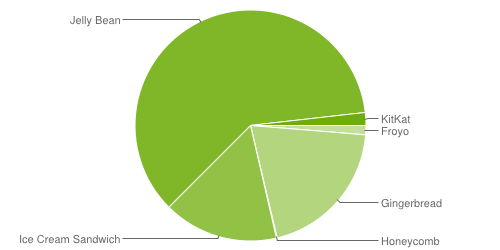 I'm hoping to see a bump in that number for Kit Kat with Moto X and HTC One devices getting the boost late in the month. With more than half the devices now running 4.1 or higher the level of service for all devices should be practically the same. Seeing that Gingerbread 'hanger on' diminish is also very nice. But there's just a crap load of devices out there that folks bought that will never get higher (Glide, Ace, etc...). Using my historical table and following the trend it looks like it'll be about November before it's finally at zero (and at the rate ICS is going it'll be gone just a month or 2 after that).